KAMPALA. I wish to respond to the missive that Mr Museveni wrote two days ago to the UPDF UPF and other security agencies all of which fall under his direct command and supervision. I will first deal with two aspects of that missive. He glibly argued that torture used to be applied under African customary practices, but he did not distinguish or explain the fact that torture was not always indiscriminately applied to every one suspected of a crime. The proverb he quoted ”Akabwa kaibire kariha omungongo” (the dog which has stolen pays with it`s back) refers to a guilty party and the punishment he/she receives. It does not refer to someone who is merely suspected of a particular offence. There were procedures which had to be taken before a verdict of guilt was arrived at. It therefore does not refer to a person who was merely suspected of committing a crime. The second aspect of the missive I wish to address is Mr Museveni’s reference to the fact that the allegations of torture were or are being brought up by the media and CSOs. the IGP, Kale Kayihura has categorically told the press in the past that he gets his orders directly from Mr Museveni, and not the line Ministers. 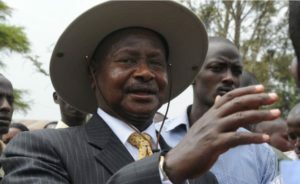 Mr Museveni gets daily Intelligence Briefs from all the armed forces and Intelligence Orgarnisations, so it is inconceivable that he has no direct knowledge of what has been going on in places like Nalufenya Police Station. He himself told the whole nation that the UPF is highly infiltrated by criminals when he visited the late AIGP Kaweesi’s home in Kulambiro. This, then brings me to the question of Command Responsibility. Command responsibility, sometimes referred to as the Yamashita standard or the Medina standard, and also known as superior responsibility, is the legal doctrine of hierarchical accountability. The term may also be used more broadly to refer to the duty to supervise subordinates, and liability for the failure to do so, both in government, the military and with regard to corporations and trusts. The “Medina standard” is based upon the 1971 prosecution of US Army Captain Ernest Medina in connection with the My Lai Massacre during the Vietnam War. It holds that a commanding officer, being aware of a human rights violation or a war crime, will be held criminally liable when he does not take action. In The Art of War, written during the 6th century BC, Sun Tzu argued that it was a commander’s duty to ensure that his subordinates conducted themselves in a civilised manner during an armed conflict. Similarly, in the Bible (Kings 1: Chapter 21), within the story of Ahab and the killing of Naboth, King Ahab was blamed for the killing of Naboth on orders from Queen Jezebel, because Ahab (as king) is responsible for everyone in his kingdom. By finding Yamashita guilty, the Commission adopted a new standard, stating that where “vengeful actions are widespread offences and there is no effective attempt by a commander to discover and control the criminal acts, such a commander may be held responsible, even criminally liable. Following In re Yamashita, courts clearly accepted that a commander’s actual knowledge of unlawful actions is sufficient to impose individual criminal responsibility. After World War II, the parameters of command responsibility were thus increased, imposing liability on commanders for their failure to prevent the commission of crimes by their subordinates. These cases – the latter two part of the Nürnberg tribunals – discussed explicitly the requisite standard of mens rea, and were unanimous in finding that a lesser level of knowledge than actual knowledge may be sufficient. D. Operational command: military leadership. In Yamashita it was established that operational command responsibility cannot be ceded for the purpose of the doctrine of command responsibility; operational commanders must exercise the full potential of their authority to prevent war crimes – failure to supervise subordinates or non-assertive orders does not exonerate the commander. Prisoners-of-war (POW) camp commanders: the ICTY established in the case of Aleksovski that POW camp commanders are entrusted with the welfare of all prisoners, and subordination in this case is irrelevant. Executive commanders: supreme governing authority in the occupied territory. Subordination is again irrelevant – their responsibility is the welfare of the population in the territory under their control, as established in the High Command and Hostages cases after World War II. De facto (factual) command, which specifies effective control, as opposed to formal rank. This needs a superior-subordinate relationship. Power of influence: influence is recognised as a source of authority. Evidence stemming from distribution of tasks: the ICTY has established the Nikolic test – superior status is deduced from analysing distribution of tasks within the unit, and the test applies both to operational and POW camp commanders. Mr Museveni therefore must do more than just write letters in order to make torture a thing of the past in this country.